1982 | Comedy, Adventure, Family, Fantasy, Romance | 55 min | NR Quick Pick a Comedy or TV Special or a Play COMEDYGRAPHY 2009 - Weapons of Self Destruction 2002 - Live on Broadway 1986 - Live at the Met 1983 - An Evening with Robin Williams 1983 - Throbbing Python of Love 1979 - Reality... What a Concept! 1978 - Live at the Roxy PLAYS 2011 - Bengal Tiger at the Baghdad Zoo 2003 - The Exonerated 1988 - Waiting for Godot 1976 - The Lover TV APPEARANCES & OTHER WORKS 2013 - The Crazy Ones 2008 - SVU: Special Victims Unit 2001 - Inside the Actors Studio 2000 - 2002 - Audible 2000 - Celebrate Humanity Campaign 1994 - Homicide: Life on the Street 1991 - A Wish For Wings That Work 1982 - Faerie Tale Theatre 1982 - Mork & Mindy/Laverne & Shirley/Fonz Hour 1978 - 1982 - Mork & Mindy 1977 - Can I Do It 'Till I Need Glasses? 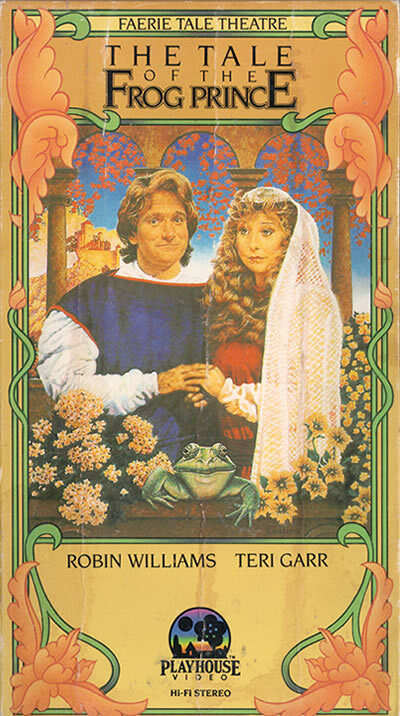 A vain, spoiled princess is forced to keep her promises when an enchanted frog rescues her golden ball from the bottom of a well. Pardon me, could you not make so much noise? You're scaring away all the flies. I'm on top of the well, dear. Oh! A nasty princess! And I am not a toad; I am a frog and fiercely proud of it. Ohhh... Oh! Yeah! Oh... oh, so this is silk. Oh, it's as smooth as a little froggy's tush. Ew. Frog skins are slimy. You're very prejudiced, you know that, don't you? Oh, just go to sleep. Ah, but still, you're very beautiful in your own bitchy way.